Tropical North Queensland is home to a fantastic range of tourist attractions which offer a fun experience for the whole family. Most of the day tours that depart Cairns and Port Douglas include stops at many of these attractions including the Kuranda Scenic Railway and Wildlife Experience, Tjapukai Aboriginal Cultural Park and Skyrail Rainforest Cableway to name a few. Whether exploring by 4WD, mini bus or luxury coach, these Daintree tours depart Cairns, Palm Cove and Port Douglas and offer a spectacular insight into this World Heritage listed rainforest. 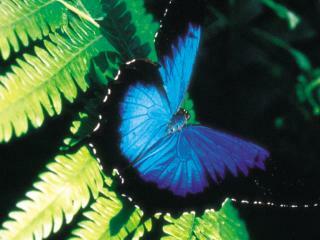 Travelling as far as Cape Tribulation and Bloomfield Falls, most tours also include time on the Daintree River. 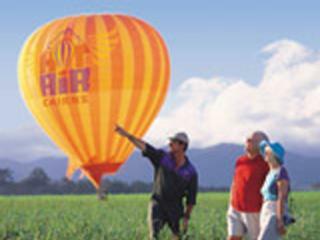 A unique way to take in the breathtaking beauty of North Queensland, these hot air balloon flights provide a different perspective on wonderful natural attractions such as the Atherton Tablelands and uninterrupted views of the ocean. The inflation process begins and then it's into the basket and before you know it you're soaring across the beautiful blue skies. Cairns and the Northern Beaches regions are also home to the Russell, Baron and Tully Rivers which offer rapids that range in grading from 1 to 4 depending on the season. 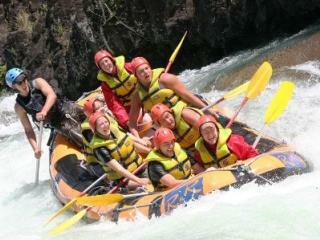 This is an adventurous way to enjoy the tropics and white water rafting offers a way to see some areas of these regions you wouldn't ordinarily get to see. The Great Barrier Reef is an amazing natural attraction and there are an equally amazing range of ways to explore it including day trips, sailing adventures, luxury catamarans, hot air balloon flights, scenic helicopter flights and snorkelling and diving tours.